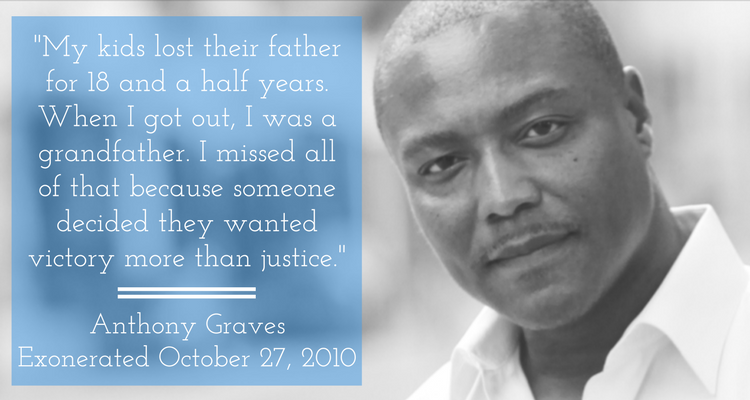 162 individuals have been released from death rows nationwide due to evidence of their wrongful conviction. This includes 13 people in Texas. On June 8, 2015, Harris County District Attorney Devon Anderson announced her office was dismissing the capital murder charges against Alfred Dewayne Brown, who has spent the last decade on death row in Texas for the murders of Houston Police Officer Charles R. Clark and store clerk Alfredia Jones at a check-cashing business in 2003. Brown consistently maintained his innocence. 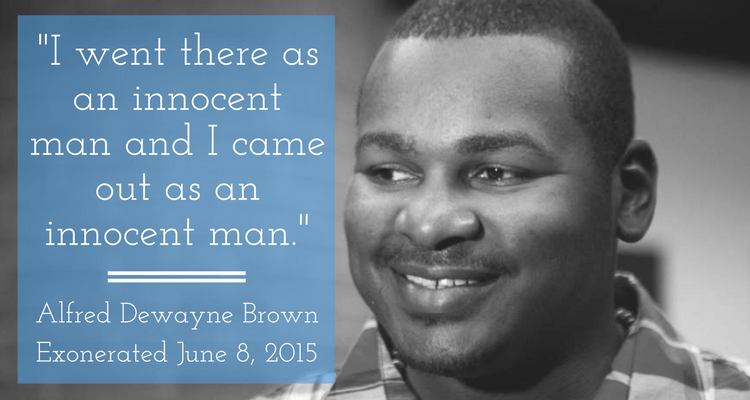 Alfred Brown is the 13th person released and exonerated from death row in Texas and the 154th nationwide. On November 5, 2014, the Texas Court of Criminal Appeals overturned Brown’s conviction and death sentence after finding the Harris County District Attorney’s Office withheld material evidence favorable to his case, specifically, a record of a phone call that corroborated his claim that he was at his girlfriend’s apartment the morning the murder took place. In 2013, a homicide detective found a box of phone records in his garage that indicated Brown made the call exactly when he asserted. The file was never shared with Brown’s defense counsel during his original trial. At his trial, Brown’s attorneys presented no evidence of his alibi, and his girlfriend changed her testimony after she was threatened with prosecution by a grand jury. The Harris County District Attorney’s Office agreed that relief should be granted. On October 28, 2009, Travis County, Texas, prosecutors moved to dismiss all charges against Michael Scott and Robert Springsteen, who had been convicted of the murder of four teens in an Austin yogurt shop in 1991. (Springsteen was convicted in 2001; Scott in 2002.) Springsteen had been sentenced to death and Scott was sentenced to life in prison. The convictions of both men were overturned by the Texas Court of Criminal Appeals because they had not been adequately allowed to cross examine each other. (See Springsteen v. Texas, No. AP-74,223 (May 24, 2006)). State District Judge Mike Lynch had released the defendants on bond in June, pending a possible retrial by the state. However, sophisticated DNA analysis of evidence from the crime scene did not match either defendant and the prosecution announced it was not prepared to go to trial. The judge accepted the state’s motion to dismiss all charges. Prosecutors are still trying to match the DNA from crime with a new defendant.”This has been a long time coming,” said Scott, once charges were dropped, “and I’m happy to be here.” Both Scott and Springsteen implicated themselves at the time of their arrest, 8 years after the crime. However, both claimed that their statements had been coerced by police. The police investigation had been compromised from the start because the building had been set on fire, and thousands of gallons of water were poured on the crime scene before an investigation was carried out. Travis County District Attorney Rosemary Lehmberg issued a statement that said in part: “Make no mistake, this is a difficult decision and one I would rather not have to make.”(S. Kreytak, “Charges dismissed in yogurt shop case,” Austin American-Statesman, October 28, 2009; see also J. Vertuno, “Murder counts tossed in Texas yogurt shop slayings,” Associated Press, Oct. 29, 2009). Michael Blair was sentenced to death for the 1993 murder of 7-year old Ashley Estell. In May 2008, following a re-investigation of the case by the Collin County prosecutor’s office, District Attorney John Roach announced that in light of the results of advanced DNA testing and the absence of any other evidence linking him to the crime, Mr. Blair’s conviction could no longer be upheld.The Texas Court of Criminal Appeals upheld the decision of the Collin County trial court that:”The post conviction DNA results and the evidence discovered in the State’s new investigation have substantially eroded the State’s trial case against [applicant]. This new evidence in light of the remaining inculpatory evidence in the record, has established by clear and convincing evidence that no reasonable juror would have convicted [applicant] in light of newly discovered evidence.”Although the court recommended that a new trial be granted, the prosecution, in light of the evidence, chose not to pursue a retrial. In a dismissal motion filed in August 2008, prosecutors determined that “this case should be dismissed in the interest of justice so that the offense charged in the indictment can be further investigated.” All charges against Mr. Blair in this case were dismissed in August 2008. He remains in prison serving out life sentences for other crimes.”Court Dismisses Ashley’s Killer, cites DNA Test,” Associated Press, The Houston Chronicle, September 17, 2008; Ex Parte Michael Nawee Blair, Nos. AP-75,954 & AP-75,955, Texas Court of Criminal Appeals, June 25, 2008 at 3. Ernest Ray Willis was sentenced to death for the 1986 deaths of two women who died in a house fire that was ruled an arson. Seventeen years later, Pecos County District Attorney Ori T. White revisited the case after a federal judge overturned Willis’ conviction. (Willis v. Cockrell, 2004 WL 1812698 (W.D.Tex.)) White hired an arson specialist to review the original evidence, and the specialist concluded that there was no evidence of arson. Willis, who was staying briefly at the house where the fire occurred, escaped from the house. Investigators believed they found an “accellerant” in the carpet. Officers at the scene of the blaze said that Willis had acted strangely, and prosecutors had Willis arrested. Despite limited evidence, Willis was indicted for murder and arson. Prosecutors used Willis’ dazed mental state at trial – the result of state-administered medication – to characterize Willis as “coldhearted” and as a “satanic demon.” Willis’ court-appointed lawyers, one of whom later surrendered his law license following drug charges, offered little defense. The attorneys spent a total of three hours with Willis, and as a result, Willis was found guilty and sentenced to death.The state’s new arson specialist revealed, however, that the “accellerant” initially suspected of causing the fire was in fact “flashover burning,” consistent with electrical fault fires. U. S. District Judge Royal Ferguson held that the state had administered medically inappropriate antipsychotic drugs without Willis’ consent; that the state supressed evidence favorable to Willis; and that Willis received ineffective representation at both the guilt and sentencing phases of his trial. He ordered the state to either free Willis or retry him. The state attorney general’s office declined to appeal, and prosecutors dropped all charges against Willis. White, whose predecessors prosecuted Willis, said that Willis “simply did not do the crime. … I’m sorry this man was on death row for so long and that there were so many lost years.” (Los Angeles Times, October 7, 2004). Willis, who had no prior record, was released on October 6, 2004 with $100, ten days of medication, and the clothes on his back. (Los Angeles Times, Houston Chronicle, and Dallas Morning News, October 7, 2004). Guerra was sentenced to death for the murder of a police officer in Houston. Federal District Judge Kenneth Hoyt ruled on Nov. 15, 1994 that Guerra should either be retried in 30 days or released, stating that the actions of the police and prosecutors in this case were “outrageous,” “intentional” and “done in bad faith.” He further said that their misconduct “was designed and calculated to obtain . . . another ‘notch in their guns. '” (Guerra v. Collins, 916 F. Supp. 620 (S.D. Texas, 1995)). Judge Hoyt’s ruling was unanimously upheld by the U.S. Court of Appeals. (Guerra v. Johnson, 90 F.3d 1075 (5th Cir. Tex. 1996)). Although Guerra was granted a new trial, Houston District Attorney Johnny Holmes dropped charges on April 16, 1997 instead. Guerra returned to his native Mexico. (New York Times, 4/17/97). Deeb was originally sentenced to death for allegedly contracting with three hitmen to kill his ex-girlfriend. The hitmen were also convicted and one was sentenced to death. Deeb consistently claimed no involvement in the crime. Deeb’s conviction was overturned by the Texas Court of Criminal Appeals in 1991 because improper evidence had been admitted at his first trial. With an experienced defense attorney, Deeb was retried and acquitted in 1993. (Deeb v. State, 815 S.W.2d 692 (Tex. Crim. App. 1991) and The Dallas Morning News, 11/4/93). Macias was convicted and sentenced to death for the murder of a man during a burglary. Macias was implicated by a co-worker, who in exchange for his testimony was not prosecuted for the murders, and from jail-house informants. Post-conviction investigation by pro bono attorneys discovered substantial evidence of inadequate counsel. A federal district court ordered a new hearing finding that “[t]he errors that occurred in this case are inherent in a system which pays attorneys such a meager amount.” Macias’s conviction was overturned and a grand jury refused to reindict because of lack of evidence. (Marinez-Macias v. Collins, 810 F Supp. 782 (W.D. Tex. 1991), National Law Journal, 5/20/96, and University of Massachusetts Alumni Magazine, Spring 1994). Brandley was awarded a new trial when evidence showed prosecutorial suppression of exculpatory evidence and perjury by prosecution witnesses. An investigation by the Department of Justice and the FBI uncovered more misconduct, and in 1989 a new trial was granted. Prior to the new trial, all of the charges against Brandley were dropped. Brandley is the subject of the book White Lies by Nick Davies. (Ex Parte Brandley, 781 S.W.2d 886 (Tex. Crim App. 1989),The Dallas Times Herald, 10/2/90, and Washington Post, 2/1/95). Despite several witnesses who testified that he was 800 miles from the scene of the murder, Skelton was convicted and sentenced to death for killing a man by exploding dynamite in his pickup truck. The evidence against him was purely circumstantial and the Texas Court of Criminal Appeals found that it was insufficient to support a guilty verdict. The Court reversed the conviction and entered a directed verdict of acquittal. (Skelton v. State, 795 S.W.2d 162 (Tex. Crim. App. 1989) and The Dallas Morning News, 10/25/90). Adams was convicted of killing a Dallas Police officer and sentenced to death. After the murder David Harris was arrested for the murder when it was learned that he was bragging about it. Harris, however, claimed that Adams was the killer. Adams trial lawyer was a real estate attorney and the key government witnesses against Adams were Harris and other witnesses who were never subject to cross examination because they disappeared the next day. On appeal, Adams was ordered to be released pending a new trial by the Texas Court of Appeals. The prosecutors did not seek a new trial due to substantial evidence of Adam’s innocence. Adams case is the subject of the movie, The Thin Blue Line. (Ex Parte Adams, 768 S.W.2d 281 (Tex. Crim App. 1989), Time, 4/3/89, and ABA Journal, 7/89). After a new trial was ordered, the prosecution dropped the charges when a key prosecution witness refused to testify.